Mike McClaskey will address students as the commencement speaker for the December graduation ceremony. Commencement will take place at 1:30 p.m. Dec. 15 in Pershing Arena. McClaskey has been recently appointed as senior vice president and chief information officer for EchoStar Communications, headquartered in Englewood, Colo.
EchoStar Communications is a publicly traded company with 21,000 employees and provides direct broadcast satellite television products to customers worldwide through its DISH Network TM. DISH Network is a single source for equipment distribution, sales, installation, service and programming. McClaskey is concluding a 12-year career with Perot Systems in Plano, Texas, where he currently serves as vice president and chief information officer and also leads its internal IT operations, the Enterprise Quality & Standards team, and the Intellectual Property (IP) program. McClaskey’s responsibilities included oversight of all improvements in productivity and standards across the entire global operation as well as demonstrating Perot Systems’ unique capabilities to the market. He previously led the Infrastructure Solutions team, where he established business operations in India, Mexico and Romania, oversaw a significant expansion of the company’s U.S. data center space in two states, and directed a global overhaul of the technologies used to support customers. He has worked in Europe, Asia and North America, and was named a Premier 100 IT Leader by Computerworld magazine. McClaskey was also responsible for aligning the company’s internal information technology environment and processes with business strategy across more than 130 locations in 15 countries. He has been instrumental in the integration of the company’s global operations, and has led enterprise-wide initiatives in standardized ERP, CRM, customer satisfaction, knowledge management, and remote access solutions. Under his leadership, Perot Systems attained its highest-ever ranking in the 2005 Information Week 500 (No. 6 overall and No. 1 among IT companies) and underwent a significant transformation of back-office and front-office systems. McClaskey, who grew up in Kirksville, has 20 years of experience in the information technology industry and previously held strategy, planning and operations management roles in several large academic networking and computing environments in his home state of Missouri. He earned a Master of Arts degree in English from the University of Missouri, and Bachelor of Arts and Bachelor of Science in Education degrees from Truman State University. McClaskey currently serves on the Truman State University Foundation Board of Directors and is a member of Truman’s “Bright Minds Bright Future” campaign steering committee. He is married to Janet Yearns McClaskey who grew up in Queen City, Mo., and graduated from Truman in 1984. Both are members of the Dallas Alumni Chapter and the Truman Alumni Association. On Dec. 6, at approximately 9:30 a.m., 88.7 The Edge hit the airwaves again for the first time since May 2007. KTRM, which is the student-run Truman State University radio station, has been off the air due to the move from the Student Union Building to Barnett Hall 1217 and issues getting the station’s new transmitter and equipment installed. The new transmitter allows for the station to be broadcast in HD (high definition). KTRM is one the first stations in northeast Missouri to broadcast digital signals. 88.7 The Edge will resume its alternative format for Truman State University, Kirksville and the surrounding area. The station will also continue to offer news broadcasts, live remote broadcasts, live sports broadcasts and specialty shows such as jazz, hip-hop, metal and showtunes. Song requests are encouraged and can be made by calling the Edge line at 785.KTRM. 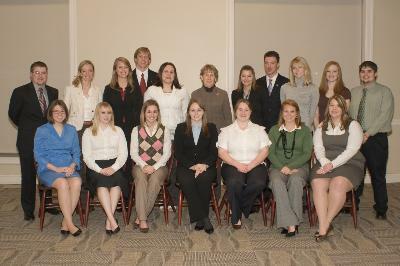 Pictured are interns (seated, left to right) Emily Kiddoo, Michelle Landers, Elizabeth Bonanno, Stephanie Vandas, Leigh Wickell, Nicole Rust and Casey Sharp; (standing, left to right) Robert Ritchie, Courtney Robbins, Elizabeth Andrew, Lucas Pendry, Sylwia Dabrowska, University President Barbara Dixon, Kristin Jacobs, Taylor Burks, Sarah Felts, Elisha Redel and Brian Johnson. Andrea Cosgrove, Nicole Ray, Jeff Spahr and Cara Willoughby are not pictured. Twenty-one Truman State University students will begin legislative internships at the Missouri State Capitol in Jefferson City next semester as part of the Missouri Government Internship program. The internship provides an inside look at state government. While in Jefferson City, the interns will be assigned to public officials based on compatibility and interests. The interns work with their legislator and his/her staff on a variety of jobs and tasks. The Truman interns will begin working with state representatives, legislators and in statewide offices with the start of the session Jan. 9. The spring interns are Elizabeth Andrew, a junior political science major from Warrensburg, Mo. ; Elizabeth Bonanno, a junior political science and Spanish double major from Columbia, Mo. ; Taylor Burks, a senior justice systems major from Neosho, Mo. ; Andrea Cosgrove, a history major from St. Peters, Mo. ; Sylwia Dabrowska, a junior political science and history double major from Des Moines, Iowa; Sarah Felts, a junior political science and communication double major from St. Louis, Mo. ; Kristin Jacobs, a junior justice systems major from Kirksville, Mo. ; Brian Johnson, a junior political science major from Fenton, Mo. ; Emily Kiddoo, a senior political science major from Memphis, Mo. ; Michelle Landers, a sophomore political science major from Weldon Springs, Mo; Lucas Pendry, a junior political science major from Galesburg, Ill.; Nicole Ray, a junior English and pre-education major from Coffey, Mo. ; Elisha Redel, a junior justice systems major from Eureka, Mo. ; Robert Ritchie, a junior political science and history double major from Warrenton, Mo. ; Courtney Robbins, a junior political science major from Lee’s Summit, Mo. ; Nicole Rust, a junior political science major from Manchester, Mo. ; Casey Sharp, a junior political science and justice systems double major from St. Joseph, Mo. ; Jeff Spahr, a senior political science and history double major from Overland Park, Kan.; Stephanie Vandas, a junior political science major from Ballwin, Mo. ; Leigh Wickell a junior English major from Springfield, Mo. ; and Cara Willoughby, a junior biology major from Owensville, Mo. The Board of Governors approved sabbatical recommendations at the Dec. 1 Board of Governors meeting. The following faculty were approved for sabbatical for the 2008-2009 academic year: Elisabeth Hooper, associate professor of biology; Jennifer Jesse, associate professor of philosophy and religion; Royce Kallerud, associate professor of English; Priya Kambli, associate professor of art; Chad Mohler, associate professor of philosophy and religion; Maria Nagan, associate professor of chemistry; and Eric Patterson, associate professor of chemistry. The following faculty were approved for sabbatical for the 2009 spring semester: Pamela Ryan, associate professor of mathematics; Karen Smith, associate professor of psychology; and Steven J. Smith, professor of mathematics. The Truman State University Model United Nations team recently returned from its annual conference, held Nov. 17-20 in Chicago. Model U.N. is a simulation program where students role-play diplomats representing the states that are members of the U.N. Truman students represented Canada and Montenegro at the 2007 conference. Participants draft resolutions on various international topics now confronting the organization, which are then put to a vote of the delegations present. Resolutions that pass are forwarded to U.N.’s headquarters in New York for consideration there. Delegations may also receive recognition for outstanding representation of their assigned states during conference simulations. Truman’s delegation received recognition for its issue position papers presented at the conference. Truman will represent Romania and Venezuela at the 2008 conference. Students interested in further information on this program should contact Jeff Wm. 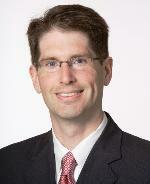 Justice, assistant professor of political science, at 785.7243 or jjustice@truman.edu. Further information on the program is available at the American Model United Nations Web site, http://www.amun.org. The 2007-2008 edition of “Who’s Who Among Students in American Universities and Colleges” will include the names of 62 students from Truman State University who have been selected for their outstanding academic achievement, character, leadership and service. The students will be recognized for their achievements at a luncheon from noon to 1:30 p.m. Feb. 23 in the Student Union Building Georgian Room. The following students will be recognized: Samantha Allinson, Leah Allman, Kristina Anderson, Lindsey Barkho, Leah Braxton, Nancy Dahlby, Mariya Davidkova, Carolyn DeCarli, Rebecca Define, Jennifer Dempsey, Jennifer Dine, Devin Dorosh, David Failing, Bethany Falkner, Jessica Gasch, Vanity Gee, Kristel Givogue, Corey Hasting, Ashley Hawkins, Alexander Hayden, Brandy Holmes, Katrina Hough, Jennifer Jacobi, Tiffany Johnson, Emily Kiddoo, Stephanie Kimball, Marissa LaRose, Anna Locke, Thomas Madsen, Jamie Matthews, Nicholas McKeever, Allison Meadows, Ashli Meek, Lisa Miller, Courtney Moran, Cassandra Morrow, Keisha Murray, Phuong Nguyen, Chinazor Oguejiofor, Tara Osseck, Laura Prather, Cody Pusateri, Kenneth Raby, Kathleen Redmon, Jane Reiling, Wynter Rice, Joslyn Richardson, Paul Rotert, Sheila Rustemeyer, Jennifer Salmon, Mariam Savabi, Ananth Sezhiyan, Natalie Soltys, Erin Thomas, Kimberly Tipton, Bonnie Treichel, Joanna Venneman, Nathaniel Webber, Jamie Weninger, Gregory Wisa, Jonathan Wolf and Wei Xie. The National Security Education Program (NSEP) David L. Boren Scholarships offer a unique opportunity for U.S. undergraduates to study abroad. NSEP awards scholarships to American students for study of world regions critical to U.S. interests (including Africa, Asia, Eastern Europe, Eurasia, Latin American and the Caribbean, and the Middle East). Boren Scholarships are intended to provide support to U.S. undergraduates who will pursue the study of languages and cultures currently underrepresented in study abroad. For complete information visit http://www.iie.org/programs/nsep/undergraduate and contact the campus representative, Maria C. Di Stefano at mdistefa@truman.edu. Campus deadline for applications is Jan. 5. The Jack Kent Cooke Foundation identifies and supports young people of exceptional promise, application, deportment and character who have financial need and demonstrated excellence in academic endeavors and extracurricular activities to reach their full potential through education. The Foundation awards scholarships that total as much as $50,000 per year to college seniors or recent graduates to attend graduate or professional programs. The Foundation receives approximately 1,000 nominations for each program, making them among the largest and most competitive scholarships in the country. For complete information visit http://www.jackkentcookefoundation.org and contact the campus representative, Maria C. Di Stefano at mdistefa@truman.edu. Deadline to declare intent to apply is Jan. 31. Campus deadline for applications is Feb. 15. The Webster Groves Herb Society is offering a scholarship up to $3,000 to qualifying sophomore, junior, senior and graduate students enrolled in a Missouri college or university who are majoring in horticulture, floriculture, landscape design, botany, plant pathology, forestry, agronomy, environmental concerns, city planning, land management or allied subject. Applications for 2008-2009 academic year must be submitted on required application form and mailed to the Webster Groves Herb Society. Visit the Truman State University Financial Aid office in McClain Hall 103 for an application for this scholarship. Deadline for scholarship submission is March 1. Donated food is displayed in Pickler Memorial Library. The food will be donated to the Central Missouri Food Bank. 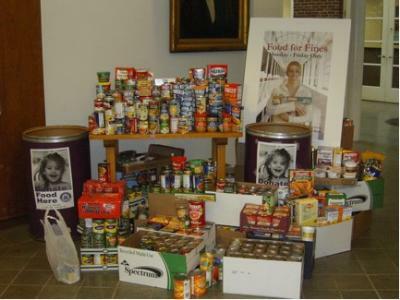 Pickler Memorial Library held a food drive for the Central Missouri Food Bank recently. The library waived $1 in fines for every one item donated. The library collected 2,000 items of food and waived $1,650 in library fines. The library thanks everyone for helping make this a huge success. Journalists from the Index, News 36 and KTRM will be on the ground at the Iowa caucuses from Jan. 1-4 to provide up-to-the-minute coverage targeted to Truman students and Adair County residents. Becker, Index editor in chief, at mnbecker@gmail.com. The Truman Media Network, composed of the Index, News 36 and KTRM, will provide coverage of the issues and events most relevant to Truman students. A multicultural hour of song, excerpts from Martin Luther King Jr., spoken word and dance including performances by Unique Ensemble, Illusions, Linda Seidel, True Men and others. Buffet lunch begins at 11:45 a.m.
R.S.V.P. by Jan. 18 to the Public Relations Office at 785.4016. Cost is $8 per person. A Truman student may pay for his/her meal by using one meal block and $4. Students must provide their Banner ID number with a reservation. Insights and reflections of Martin Luther King Jr.’s message as it pertains to current issues. The symposium is limited to 50 participants. Call 785.4142 to sign up. Students, staff and faculty will be volunteering to help share the life and legacy of Martin Luther King Jr. Individuals interested in volunteering for the “READ In” should contact Molly Smith at the SERVE Center by phone at 785.7222 or via e-mail at serve@truman.edu. Dec. 11-13 • 7 a.m.-2 a.m.
Dec. 17-21 • 8 a.m.-5 p.m.
Dec. 27-28 • 8 a.m.-5 p.m.
Jan. 2-4 • 8 a.m.-5 p.m.
Jan. 7-11 • 8 a.m.-5 p.m.
Dec. 11-12 • 9 a.m.-11 p.m.
Dec. 13-14 • 9 a.m.-7 p.m.
Dec. 17-21 • 11 a.m.-2 p.m.
Jan. 2-4 • 11 a.m.-2 p.m.
Jan. 7-11 • 11 a.m.-2 p.m.
Jan. 13 • 2-7 p.m. The interim schedule can be found in the PDF version of this week's issue of the Truman Today. Flex Your Body - Flex Your Body is a full body toning class. People will be able to enhance their personal results by attending this challenge packed 55-minute class. Step - A cardio step aerobics routine will be followed by exercises targeting the abdominals and low back. All levels of participants are encouraged to attend. Yoga-lates - A perfect blend of yoga and pilates to increase strength, flexibility, balance, coordination and improve posture. 2-on-2 Tournament - The 2-on-2 Tournament will be played from 11 a.m. to 12:30 p.m. Teams will be formed by participants and entered via e-mail. Pre-tournament games will be played Dec. 18 and 20; with a double elimination tournament to follow. All games will be officiated according to rules published by Missouri State High School Activities Association. Drop-in Basketball - Drop-in Basketball will be played, administrated and officiated by those who are participating in the event. Badminton Tournament - Badminton Tournament will begin with pre-tournament games Dec. 19. Following these games a double elimination tournament will take place Jan. 9. 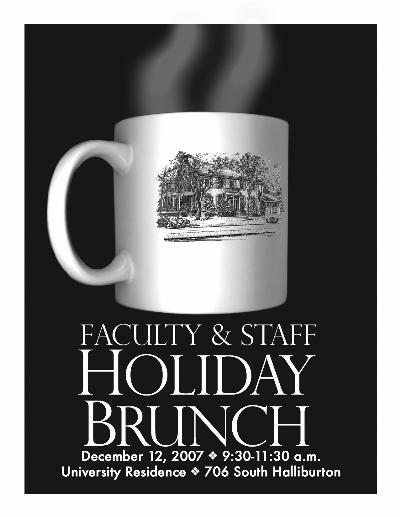 To sign up for these events e-mail Scott Wagner at swagner@truman.edu. Winner of both the 2-on-2 tournament and the badminton tournament will receive Truman State University Intramural Championship shirts. Check out the Student Recreation Center Web site at http://recreation.truman.edu for more details and upcoming events. A musical composition by Warren Gooch, professor of music theory/composition, will be performed on the 2008 National Society of Composers Conference hosted by Georgia State University. “Light of Shadow” for solo timpani has been selected for performance on the conference, which will take place Feb. 20-23. The composition was among those selected for performance from a pool of more than 600 entries. Gregory Jones, professor of music, just returned from an eight day tour of Albania that included concerts, master classes, and visits to schools and historical sites. During his visit, Jones was interviewed on live Albanian national television during their morning program, performed and worked with faculty and students at academies in Tirana, Berati and Durresi, and addressed Fulbright and U.S. Embassy officials at the European University of Tirana. He is the first American brass professor to visit Albania and plans to return with a brass ensemble in the near future. Daniel Mandell, associate professor of history, is serving as a peer review panelist for the National Endowment for the Humanities in their Grants for Teaching and Learning Resources and Curriculum Development program. Eric Patterson, associate professor of chemistry, and Maria Nagan, associate professor of chemistry, have been awarded a $158,000 grant through the National Science Foundation Research at Undergraduate Institutions program. This grant will support two undergraduate students working during the next three summers as they work to understand important interactions that give molecules of ribonucleic acid (RNA) their specific shapes. Results from this work will lead to a better understanding of biochemical processes that allow the proper synthesis of proteins. Gregg Siewert, professor of French, has been named to one of eight seats on the College Board’s AP French Language Commission to review standards and suggest revisions to the AP French language test. He attended the second meeting of this Commission in Atlanta Nov. 30-Dec. 2, and the first last February. Further meetings will be held in February, March and May 2008, with more in 2009. The College of Arts and Sciences has a vacant work study or scholarship position open beginning January 2008. Applicant must be able to perform office duties as assigned. Duties include answering phone, filing and greeting faculty, students and staff in the office. Please call 785.7200 for information or stop by Ophelia Parrish 1109. Upward Bound (KB 220) has an immediate opening for a tutor/adviser. The position entails mentoring and tutoring college-bound high school students. Review of applications will begin immediately with a plan to fill the position before the end of the semester. More information is available on the Web at http://ub.truman.edu or by calling 785.4244. IT Services invites faculty, staff and students to TechBreak at 1:30 p.m. in the Student Union Building Room 320 each Friday. Additional details and the topic schedule can be found at http://its.truman.edu/techbreak. The Recycling Center and drop-off containers will be closed Dec. 22-Jan. 1 due to the holiday break. It will reopen Jan. 2. This is the final issue of Truman Today for the fall semester. The next issue will be published Jan. 15.